A short flight brought Domo and Pipkin to Hong Kong, and they arrived just in time for dinner. 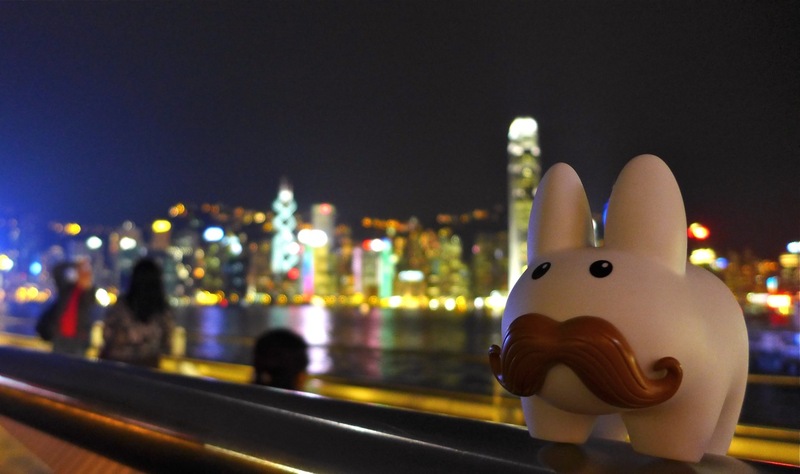 Cantonese food in Hong Kong is sooooooo good. These two are going to get soooooo fat! 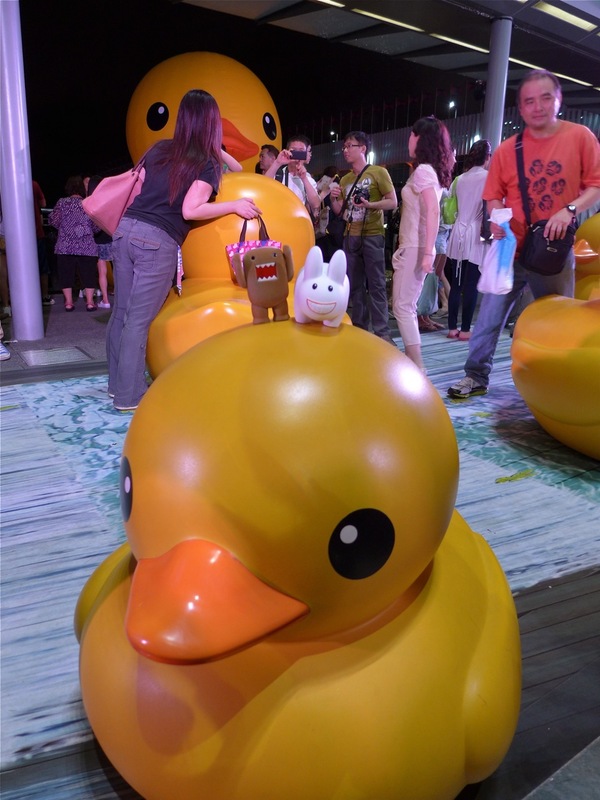 They ate a mish mash of noodle and rice dishes, dim sum and Peking Duck (yeah, they're nowhere near Beijing. Whatevs!) Their next stop was to take in the city lights of Hong Kong from the Kowloon side of Victoria Harbour. Hong Kong means "fragrant harbour". Being one of the most densely populated cities in the world (pop. 7 million) and being the middle of summer, Pipkin would agree that yes, it's rather fragrant here. All joking aside, look how pretty the lights are! 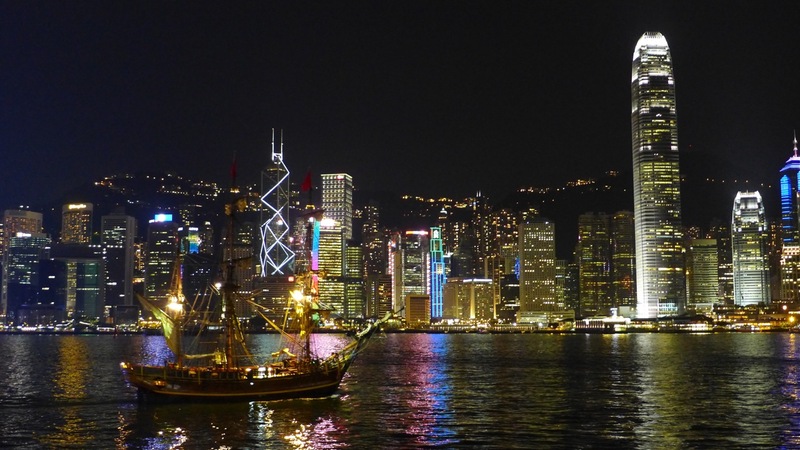 Hong Kong has a very active night life. It was nearly midnight but tons of people of all ages were out enjoying the cooler night temperatures. There were runners, couples on dates, people out eating and shopping (shops are open very late - some until 1 AM) and of course, people being tourists. 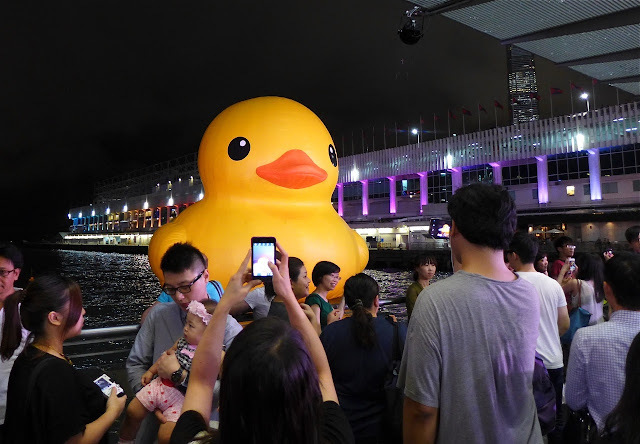 It took a while to fight through the crowd and wait a turn to take photos by the smaller ducks next to Florentijn Hofman's giant inflatable rubber ducky floating at the end of the Star Ferry Pier, but it had to be done! They'll probably return in daylight (when there are fewer people) to try and get a better look at the giant rubber ducky. 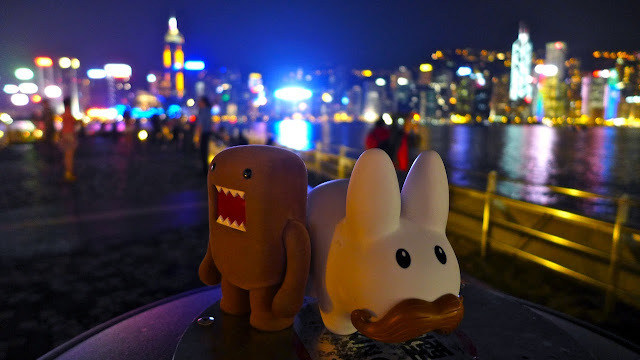 For now, the duo are going to head east along the Kowloon pier to check out the Avenue of the Stars. Till the next blog post!